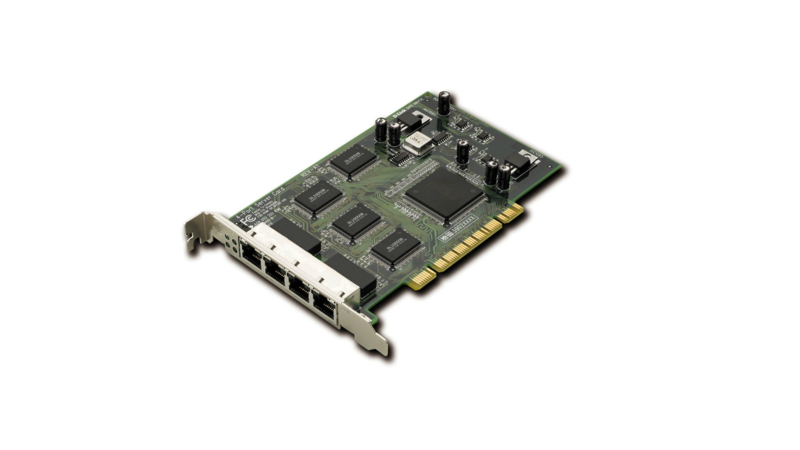 The DFE-580TX is a high-performance, versatile server card designed for very fast server connection. Outfit with 4 Fast Ethernet ports, the card gives you a 4-port trunk link from a server to a Fast Ethernet switch, providing load-sharing aggregated bandwidth and redundant backup links, allowing you to cost effectively run bandwidth-intensive and missioncritical applications in client-server Windows and Unix environments. With 4 twisted-pair ports running capable of running at fullduplex, the DFE-580TX provides connection at near Gigabit speed for servers on your existing Cat. 5 or lower grade network cable. All 4 ports support 10/100Mbps auto-sensing, and can be combined into a high-speed trunk transferring data at up to 800Mbps full-duplex. The card operates at the PCI Bus Master mode with clock speed support at up 33/66MHz. It is equipped with 4 independent MAC controllers, allowing each of the 4 ports to establish an independent full bandwidth segment with the attached switch. In the unlikely event where one MAC fails, the remaining controllers will continue to operate, guaranteeing uninterrupted server connection. You can configure all 4 ports to operate at the load-sharing mode. In this configuration, the ports share the traffic load to and from the switch, while the card ensures a balanced load for each of the ports. This mode guarantees that bottlenecks are eliminated at peak traffic time. An alternative is to configure the card with 2 redundant backed-up load-sharing trunks. One trunk is active, the other trunk in the stand-by mode. In case if one trunk fails, the other trunk will provide the backup link. This configuration can be applied for mission-critical situations, or more common applications such as video-conference and IP telephony. With packet prioritization capability, the card allows traffic to be queued as critical and non-critical, permitting your server to run voice over IP, video-conference and multimedia applications where packets are delivered at best-effort speeds. The card's embedded flow control provides a means to protect against possible data loss during transmission on the network. When connected to a Fast Ethernet switch that supports flowcontrol, the card receives signals from the switch regarding buffer overrun during peak usage periods. The card then delays transmission until the switch is ready again to accept new data.